1. I am wondering if you could update this run with all participants (right now it is up to HRP237). I know that this is some extra work but I think it is worth it. 2. I can see that all Iraqi Kurds of the Harappa Project fall into pop172, however, all Iraqi Kurds from Xing et al are in pop168 and pop162. Do you think this shift is real or just a calculator effect due to Xing et al data set? Do you see similar shift for other Xing et al populations? 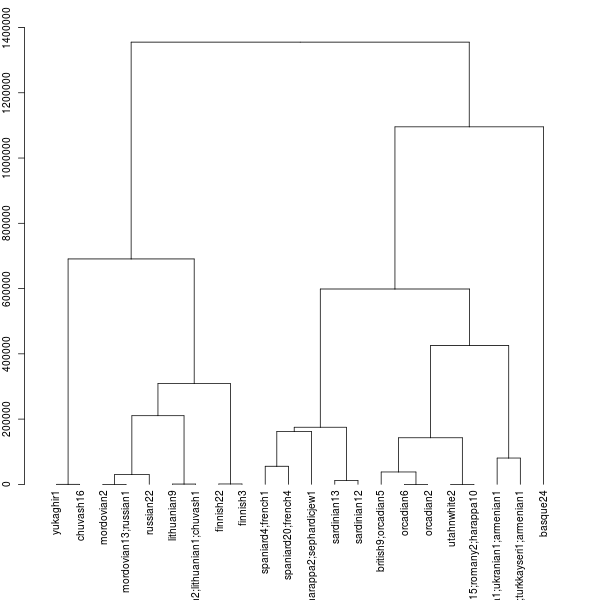 How would the Yunusbayev Kurds behave in this ChromoPainter/fineStructure analysis? Previously, I observed that the Xing Kurds appear to have more of the Caucasian component. 3. The neighbor branch of the pop162/168/172 branch consists of 1/2Indian1/2European mixed individuals. Do you think that this has some implications or is it just something like the limitations of Oracle results? 1. I cannot update this run since there's no incremental running and it took about 2 months. Next big ChromoPainter run will be when I have a large number of new samples. 2. Xing et al data is not included. The Kurds are from Harappa and Yunusbayev. 3. That's just because it likely couldn't find a good place for the 1/2 Indian 1/2 European individual. This would be interesting, especially with the Samoan and Tongans heavily leaning Asian. I would really like to see a study on the Tahitians, Hawaiians and the people of Rapa Nui contrasted with native Americans. However, some of the labels are cut off in the images since they were long. Zack, could you publish a version of the images in which the labels are fully visible? Wow, the Gujarati are scattered across the spectrum. Why would this be? I am also surprised to see the Cochin Jews and Beneisrael distant. I suspect this is because of their geographic location within the subcontinent and some Cochins being converts as opposed to the Beneisrael. The case of the Gurjarrashtrians is interesting probably related to the happenings after 800b.c. This is interesting, so what actually happened after 800 BC? I think he is talking about a discontinuity seen in the subcontinent (NW) starting about 800bc, which Nirjhar thinks is not due to the Aryans, but the das/dahae (Parthians perhaps?) tribes. You Think correct, but as you know its not exactly 2800YBP but a little after as B.B. Lal etc. Have informed. 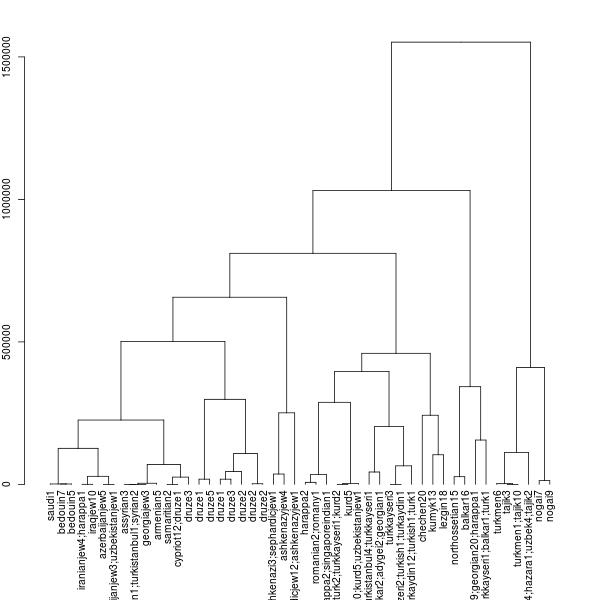 It is because many of Zack's labels are completely invisible in his above dendrograms. 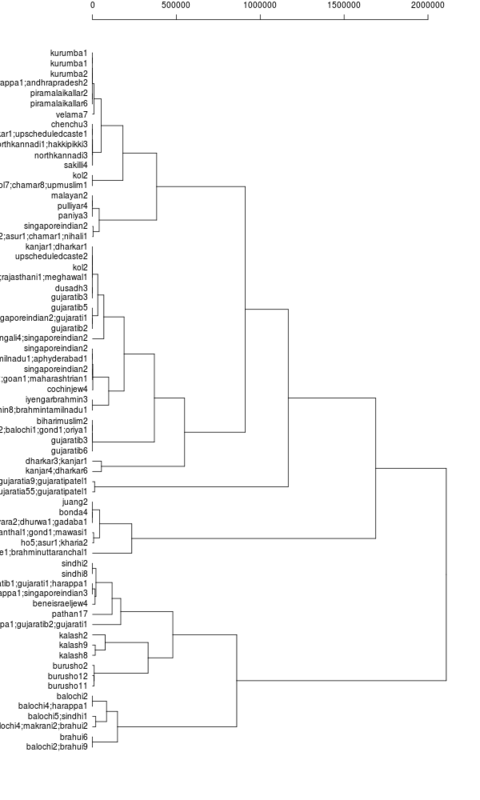 It's not possible to list all the ethnicities on these dendrograms without making them huge and unwieldy. I suggest looking at the spreadsheets for the detailed group and individual info. Is this where you come when you have been kicked off Razib's blog? Sorry, the above comment is meant solely for Nirjhar. Nirjhar, Razib is constantly asking you to 'Shut up' on his blog and every time he does, you come running to this blog ... is that clear now? You are a classic internet troll. So you don't believe in the freedom of speech and expression?. A REQUEST TO ALL: Please don't use the word "Aryan" as you know or have to know the correct word is "Arya" which as to the grammar means "Farmer". South Asia looks very homogenous in terms of population differentiation, especially considering it's size and geography. 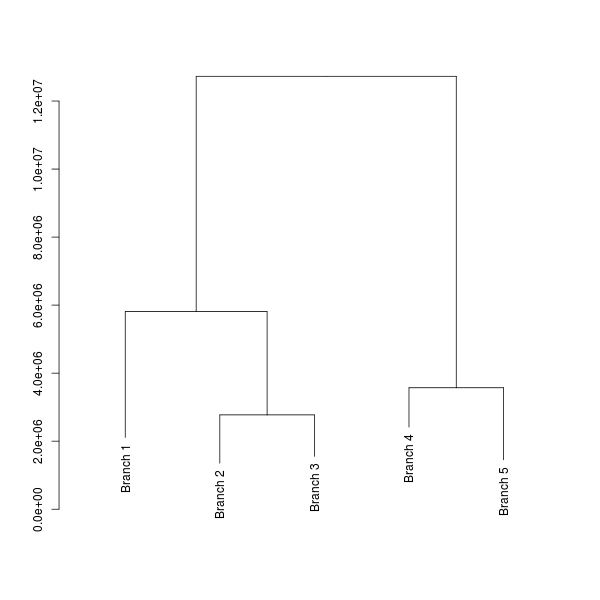 Could you please explain the meaning of numbers along vertical axis (except Branch1 where it is horizontal)?